Hood Certification & Repair: All makes and models of fume hoods, biological safety cabinets, and laminar flow clean benches. Member: IAFCA (International Air Filtration Certifier's Association) & IAFCA certified by proctored examination. ASHRAE 110 Tracer Gas Fume Hood Commissioning and Testing: This testing is recommended for all new fume hood installations and whenever changes are made to the ventilation system. BSL Suite Testing & Certification: Testing for HEPA filter integrity, temperature, relative humidity, pressure differentials, etc. ESP has successfully completed Eagleson course in BSL3 testing. 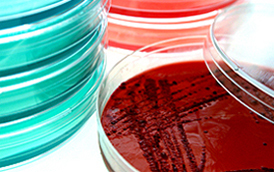 Biological Decontaminations: Removes viable organisms from all surfaces via Chlorine Dioxide or Paraformaldehyde. Performed after construction, power outages, or accidental spills. 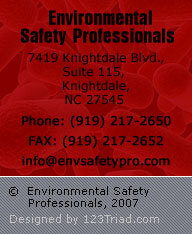 On-site Air Sampling Services: All samples analyzed by NIOSH or OSHA validated methods. Ventilation Rate Testing: Documentation of intake and exhaust cfm at each diffuser, negative pressure test, documentation of room cubic footage and calculation of total air changes per hour using NIST traceable test equipment.